Married Name 2 May 1847 As of 2 May 1847,her married name was VanGorder. Married Name 2 May 1847 As of 2 May 1847,her married name was VanGarder. Rebecca Adeline Buckley was born on 6 November 1829 at Ohio. Rebecca Adeline Buckley married Green Bentley VanGorder, son of James VanGarder and Rebecca (? ), on 2 May 1847 at Scioto, Ohio, also reported as 01 May 1846, listed as James Vangorder and Rebecca Buckly (Buckles). Rebecca Adeline Buckley and Green Bentley VanGorder were divorced in 1848. Rebecca Adeline Buckley died on 16 June 1850 at Jun, Granada, Andalucia, Spain, at age 20. 1840 Porter, Scioto, Ohio Rebecca Adeline Buckley was referenced on William J. Buckley's household in the 1840 Census at Porter, Scioto, Ohio; listed as William Buckle; Number of Free White Persons - Under 20 = 6 (2 male & 4 female); Number of Free White Persons - 20 thru 49 = 2 (1 male & 1 female); Total Number of Free White Persons = 8. Name Variation James VanGarder was also known as VanGorder. James VanGarder married Rebecca (?). James VanGarder was born in 1784 at New York. [S249] U.S. Federal Census 1850 U.S. Federal Census, by Ancestry.com, Year: 1850; Census Place: Harrison, Scioto, Ohio; Roll M432_727; Page: 110A; Image: 96. Married Name Her married name was VanGarder. Married Name Her married name was VanGorder. Rebecca (?) married James VanGarder. Rebecca (?) was born in 1787 at New York. Name Variation Mary Partain was also known as Webb. Married Name 1640 As of 1640,her married name was Hudnall. Married Name May 1660 As of May 1660,her married name was Sanders. Married Name after 1672 As of after 1672,her married name was Thomas. Mary Partain was born in 1625 at Northumberland, Virginia. She was the daughter of Robert Partain Sr. and Margret Hayle. Mary Partain married John Hudnall, son of John Hudnall and Elizabeth Clarke, in 1640 at Northumberland, Virginia. Mary Partain married Edward Sanders in May 1660 at second marriage for her. Mary Partain married William Thomas after 1672 at third marriage for her. Mary Partain died in 1683 at Northumberland, Virginia. William Withers was born in 1600 at Arkholme, Melling, Lancashire, England. He was the son of John Withers and Jenett Wither. William Withers married Frances Claiborne, daughter of William Claiborne, in 1630. William Withers died on 10 June 1684 at Arkholme, Melling, Lancashire, England. Married Name 1630 As of 1630,her married name was Withers. Frances Claiborne was born in 1600 at Arkholme, Melling, Lancashire, England. She was the daughter of William Claiborne. Frances Claiborne married William Withers, son of John Withers and Jenett Wither, in 1630. Frances Claiborne died on 20 August 1661 at Arkholme, Melling, Lancashire, England. John Taylor was born on 10 August 1607 at Carlisle, Cumberland, England. He was the son of Thomas Taylor and Margaret Swinderly. John Taylor married Elizabeth Flowers, daughter of John Flowers and Katherine Hunt, in 1624. John Taylor married Elizabeth Nin in 1637 at Worthenby, Flintshire, Wales. John Taylor died in January 1652 at Lancaster, Virginia, at age 44. John Taylor immigrated in 1610 to England to, Virginia, aboard the ship "Swan." Married Name 1637 As of 1637,her married name was Taylor. Elizabeth Nin was born circa 1610 at Hadleigh, Suffolk, England. She married John Taylor, son of Thomas Taylor and Margaret Swinderly, in 1637 at Worthenby, Flintshire, Wales. Elizabeth Nin died on 28 February 1659 at Lancaster, Virginia. Name Variation Elizabeth Goulden was also known as Golden. Name Variation Elizabeth Goulden was also known as Goulding. Name Variation Elizabeth Goulden was also known as Elisabeth. Name Variation Elizabeth Goulden was also known as Betty. Name Variation Elizabeth Goulden was also known as Gouldin. Married Name 23 December 1827 As of 23 December 1827,her married name was Chadwick. 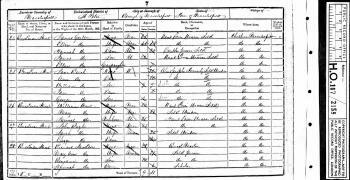 Married Name 19 December 1869 As of 19 December 1869,her married name was Hopkins. She was buried after 11 May 1891 at Jamestown Memorial Cemetery (aka Jamestown Cemetery), Jamestown, Grant, Wisconsin. 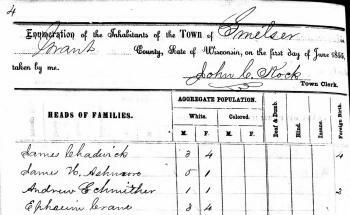 1 June 1855 Smelser, Grant, Wisconsin Elizabeth Goulden is counted on the census of 1 June 1855 in the household of James Chadwick at Smelser, Grant, Wisconsin; listed 3 male and 4 female in household; of that total, 4 were foreign born. 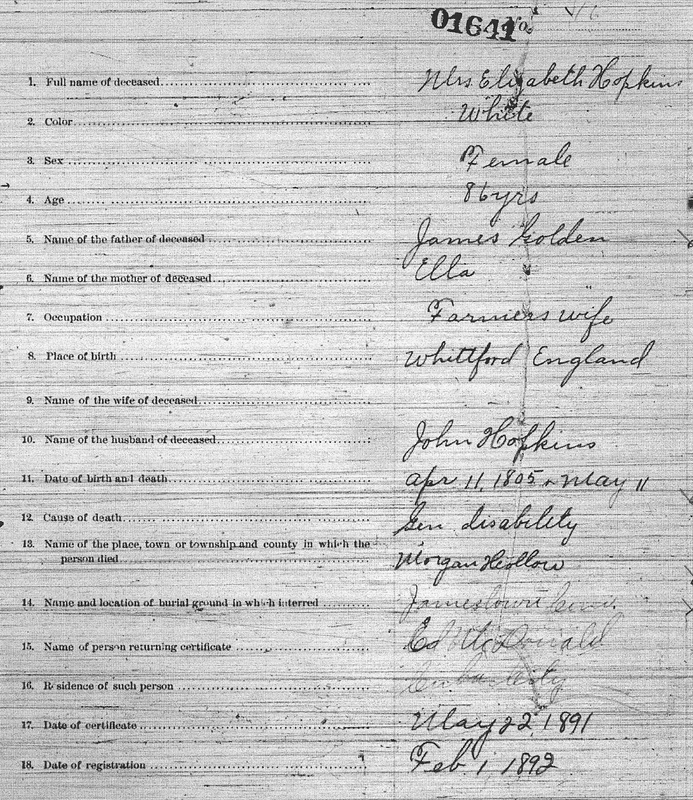 [S6] Wisconsin, Wisconsin Vital Record to 1907, death certificate number 01641. [S376] English church records parish registers, by Ancestry.com, FHL Film Number: 1751957. [S376] English church records parish registers, by Ancestry.com, FHL Film Number: 1647519. [S376] English church records parish registers, by Ancestry.com, FHL Film Number: 1656952. [S6] Wisconsin, Wisconsin Vital Record to 1907, Volume: 05 Page: 0064. [S248] U.S. Federal Census 1860 U.S. Federal Census, by Ancestry.com, Year: 1860; Census Place: Smelser, Grant, Wisconsin; Roll M653_1409; Page: 678; Image: 698; Family History Library Film: 805409. 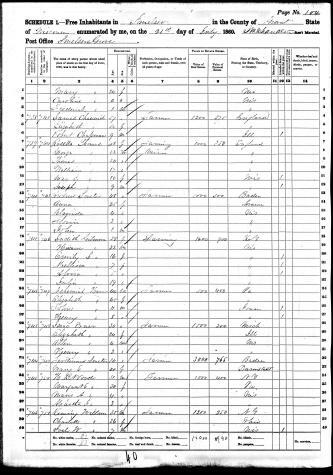 [S247] U.S. Federal Census 1870 U.S. Federal Census, by Ancestry.com, Year: 1870; Census Place: Smelser, Grant, Wisconsin; Roll M593_1717; Page: 451B; Image: 510; Family History Library Film: 553216. 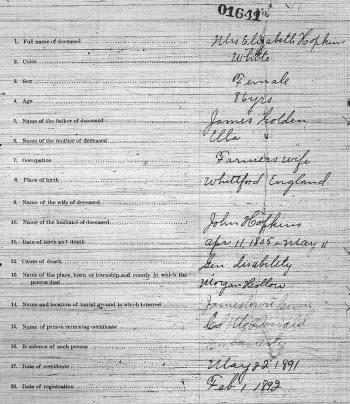 [S387] Family Search; Multiple Records, "Wisconsin State Census, 1875," database with images, FamilySearch (https://familysearch.org/ark:/61903/1:1:MMMB-H7Q : 8 November 2014), John Hopkins, , Grant, Wisconsin; State Historical Society, Madison; FHL microfilm 1,032,691. James Chadwick was born on 8 January 1806 at Dernesh, Cheshire, England. He was the son of James Chadwick and Ann Barker. James Chadwick died on 25 September 1867 at Grant, Wisconsin, at age 61. 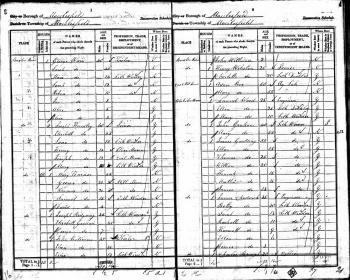 1 June 1855 Smelser, Grant, Wisconsin He appeared on the census of 1 June 1855 at Smelser, Grant, Wisconsin, listed 3 male and 4 female in household; of that total, 4 were foreign born. James Chadwick was a stone mason; built his stone house by moonlight, wheeling the material from a distance of half a mile. He was a stone-mason by trade, and was busily employed each and every day in building the houses of his neighbors, so that his own work must be done "after business hours." He was a engineer in 1841. He immigrated before 1850 likely before 1850, as his wife and children arrive in November 1850. John Hopkins was born circa 1802 at France also reported as England. He was the son of Humphrey Hopkins and Sarah (?). John Hopkins married Mary A. Mullen before 1827. John Hopkins died after June 1880. 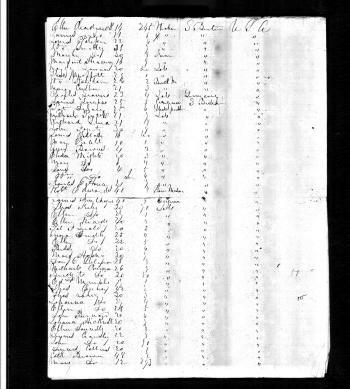 [S387] Family Search; Multiple Records, "Wisconsin State Census, 1855," database with images, FamilySearch (https://familysearch.org/ark:/61903/1:1:MMML-6SS : 14 November 2014), John Hopkins, Smelser, Grant, Wisconsin; citing line 34, State Historical Society, Madison; FHL microfilm 1,032,687. Humphrey Hopkins married Sarah (?). Sarah (?) married Humphrey Hopkins. Name Variation James Goulden was also known as Golden. Name Variation James Goulden was also known as Gouldin. James Goulden was born circa 1786 at Macclesfield, Cheshire, England. He married Mary Ellen (?) before 1805. James Goulden died after 1851. James Goulden was a Silk weaver in 1841. He was a in 1851 at hand loom weaver silk. Married Name 1624 As of 1624,her married name was Taylor. Elizabeth Flowers was born in 1610 at Hadleigh, Suffolk, England. She was the daughter of John Flowers and Katherine Hunt. Elizabeth Flowers married John Taylor, son of Thomas Taylor and Margaret Swinderly, in 1624. Elizabeth Flowers died on 28 February 1659 at Lancaster, Virginia. Thomas Taylor was born on 15 March 1574 at Hadley, London, Middlesex, England. He married Margaret Swinderly on 9 October 1599 at Hadley, Middlesex, England. Thomas Taylor died in 1618 at Hadley, Suffolk, England. Married Name 9 October 1599 As of 9 October 1599,her married name was Taylor. Margaret Swinderly was born in 1578 at Copenhagen, Denmark. She married Thomas Taylor on 9 October 1599 at Hadley, Middlesex, England. Margaret Swinderly died in 1672 at Hadleigh, Suffolk, England. Name Variation Edward Haskins was also known as Edmond. Edward Haskins married Martha (?). Creed Haskins was the son of Edward Haskins and Martha (?). Thomas Tanner married Mollie Evans. Thomas Tanner was born circa 1727 at Mecklenburg, Virginia. Thomas Tanner died in February 1806 at Mecklenburg, Virginia. Thomas Tanner lived with Lewis Tanner in 1748 at Lunenburg (later Mecklenburg County), Virginia; In 1748 and 1749 Lewis Tanner was living with his sons, Lucius and Thomas Tanner, in the part of Lunenburg County that would later become Mecklenburg County, likely on the 354 acres he secured with a patent in 1750. Name Variation Mollie Evans was also known as Mary. Mollie Evans married Thomas Tanner, son of Lewis Tanner and Margaret Haskins. Mollie Evans was born circa 1730 at Virginia. Thomas Tanner was born on 9 May 1763 at Mecklenburg, Virginia. He was the son of Thomas Tanner and Mollie Evans. Ludwell Tanner was born circa 1754 at Mecklenburg, Virginia. David Tanner was born circa 1756 at Mecklenburg, Virginia. David Tanner died circa 1775 at Mecklenburg, Virginia. (?) Tanner was the son of Thomas Tanner. Wm. M. Tanner was the son of (?) Tanner. Wm. M. Tanner married Mary H. Tanner, daughter of (?) Tanner. (?) Tanner was the son of Ludwell Tanner. Mary H. Tanner was the daughter of (?) Tanner. Mary H. Tanner married Wm. M. Tanner, son of (?) Tanner. John Hudnall married Jemima Jennings. John Hudnall was born on 8 June 1733 at Prince William, Virginia. He was the son of Joseph Hudnall and Mary Withers.